What Color Is This Little Guy? 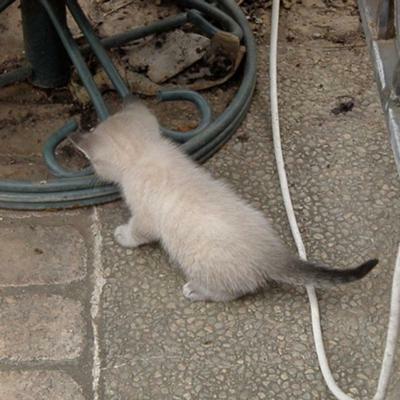 I am wondering what color this little Lynx Point might be. I originally thought it was a Blue Point (I grew up with Korats) but now his tips are much darker. They're not really brown though. They very much match the grey tabby mommy's darker colors. He's a stray that has taken to hanging out in my backyard. 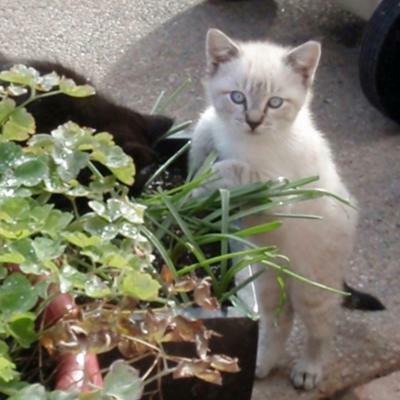 Welcome Heather, and thank you for sending in your photo of your little stray - he's a real cutie! It can be difficult to identify Siamese colors precisely from photos, especially without knowing the colors of the parents of the kitten, but you said the mom is a grey tabby and because of this I tend to agree with you - I think he is a Blue Lynx Point (more by process of eliminating the other colors than anything else) but if he continues to darken up he could turn out to be a Seal Lynx Point. 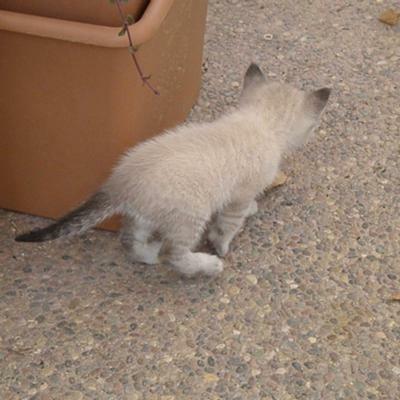 Coincidentally your question arrived on the same day as another color identification request, which you can see here - What kind of Lynx Point Siamese am I? Is Charlie a Tabby Point Siamese? What breed do I look like? Comments for What Color Is This Little Guy? Re: what color is this little guy? Hi Heather! I agree with Caroline's response to your query. 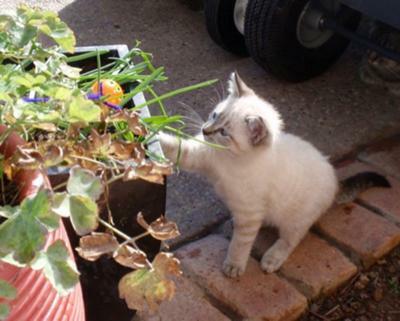 This kitty looks very similar to my blue lynx point Siamese, River, when she was that age. As many others have commented, the blue lynx points do seem to darken as they get older and then it is much easier to tell. I hope you were able to adopt this little fella! **Heather's question was originally posted in 2014 and my comment is being posted on 9/20/15. I, too, hope Heather is able to provide us with an update! Hi Heather, are you planning to adopt the little guy? He is certainly beautiful.